Yellow anthias (Odontanthias fuscipinnis) larvae were raised from wild-spawned eggs at 75-77F on wild copepods. First record of Anthias culture. The Yellow Anthias (Odontanthias fuscipinnis) is a rare, deepwater fish, endemic to Hawaii. It commands a high price in the aquarium trade. O. fuscipinnis was reared from a small number eggs collected in December, 2012 in waters off Oahu. 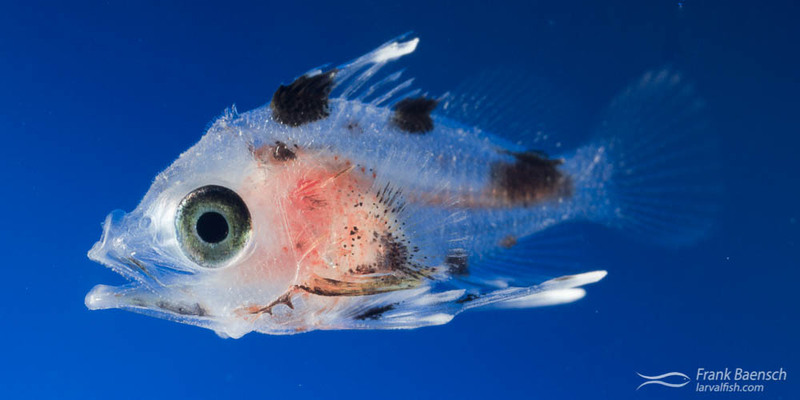 Features of the larvae include an elongated second dorsal spine and pelvic fin rays; pronounced head spination; brown pigment spots below the dorsal fin; and red pigment blotches on the body. Juvenile Yellow Anthias (Odontanthias fuscipinnis) reared in the laboratory. O. fuscipinnis larvae were fed copepod nauplii and were surprisingly easy to raise through transformation, despite being kept in a small culture tank (50L) together with multiple other species. The time from hatching through juvenile transformation was about 80 days but it is possible that the larval period could be shortened, if the larvae are cultured in larger, single-species rearing systems. Yellow Anthias (Odontanthias fuscipinnis) larvae reared in the laboratory. As O. fuscipinnis larvae make their transition to juveniles they rapidly loose the red pigmentations and take on the yellow coloration of the adults. The robust larvae and high value of O. fuscipinnis could make this species an excellent candidate for captive-breeding. Karen Brittain (Oahu, Hawaii) has been producing limited numbers of O. fuscipinnis for the aquarium trade since 2016.